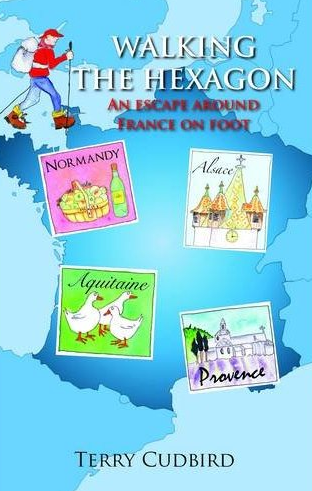 Continuing my summer travels around France from the sunlounger, I was delighted when Terry sent me a copy of his book Walking the Hexagon: An Escape Around France on Foot to review, as the whole concept of this book excited me from the moment I came across it. Taking the back roads in France is one of my favourite things to do and either by bike or car I am always amazed at the variety of the regions, landscapes, architecture and agriculture. Walking around France, sometimes alone, Terry is at one with his surroundings and describes what he sees so well I wanted to get my map out, pack a bag and head off. Terry describes himself as the fat kid at school, just like me, who was always last in sport, just like me, and who found ‘exercise’ in middle age, again like me, and says one of the reasons he undertook this adventure was to escape from facing up to the realities of his parents dementia back at home. Even when he is isolated in the Alps his journey is often interrupted by messages from home or confused calls from his Mother, it can’t have been easy for him or his wife, but it did add a personal aspect to the book. I will admit my first impression was that it was a substantial sized book, crammed with words and I wondered if it would be a bit hard going to read. However, although the 4000 mile walk was a challenge for Terry, he writes a very readable book that keeps moving at a great pace and I found the map for each chapter helpful and the photos a nice additional touch. With the memories of our recent road trip along the Pyrenees, up to Carcassonne and east to the Cevennes it was great to be familiar with the beginning of Terry’s mammoth adventure. Whilst we dabbled ignorantly into Cathar country, Terry was able to enlighten me with a potted history of who the Cathars were, why the Church disliked them and therefore why they ended up burnt at the stake. He includes lots of information as he makes his way around France, and when he is finishing his journey down the Atlantic coast using one of the Santiago De Compostela routes he educated me further! We too are on the route so I can now understand why it is not uncommon to see unusual sights locally; a young man in full length (claret) robes with his donkey, an older couple leading a pony and a large dog, both carrying panniers, cyclists with scallop shells in their bags. Some of these I would have noticed, but not really understood the significance of without Terry’s explanation of his experience following the route. I know Terry is still walking bits of France, so maybe we will hear more from him in the future, I hope so.